Online data entry offers many benefits, including the rapid and automated production of feedback. To reflect the sensitivity of some rare wintering and breeding birds we had formulated the following policy to guide the production of online feedback so that observers were satisfied that their records would be treated with the appropriate degree of sensitivity and confidentiality. Feedback included the production of online maps and the listing of species in 'Square Summaries'. The latter were viewable to registered online users and gave lists of species seen in the 10-km squares and tetrads for which the observer had entered records. Lists relate to winter (Nov-Feb) and breeding (Apr-Jul) season records only. However, given the sensitivity of some rare breeding birds we had formulated the following policy that would guide the automated production of maps online, and reproduced on paper, and the listing of species in 'Square Summaries' online and would encourage observers to submit their sightings in the knowledge that they would be dealt with appropriately. We define rare or sensitive species as those treated by the Rare Breeding Bird Panel (RBBP) and the Irish Rare Breeding Birds Panel (IRBBP), plus a small number of locally scarce species. For these species we only published maps online according to the policy outlined below governing the resolution (scale) at which records would be represented. Prior to publication in the final Atlas all maps were reviewed with RBBP and IRBBP and final decisions taken concerning scale of mapping. All other species were presented at 10-km and tetrad resolution. Below are two examples of how maps for rare or sensitive species were represented. 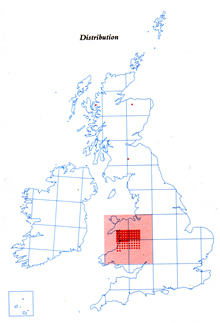 The first shows how Red Kites were treated in the 1988-91 Atlas publication, illustrating the number of records but not giving away exact locations. 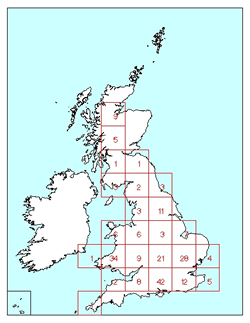 The second shows recent BirdTrack records for Red Kite, illustrating the number of 10-km squares from which records were received in each 100-km square. In both cases the maps illustrate the general status of the species without revealing exact locations and thus securing the confidentiality of records. The policy currently refers to Britain only. For the purposes of this policy we treat any records from March to July as breeding records; all records outside this period are considered non-breeding records. Unless otherwise stated (see list below) we will publish all non-breeding season records of all species at 10-km resolution and list in the 'Square Summaries' online at the tetrad level (2 x 2km square). For the purposes of mapping, during the breeding season (March to July inclusive) we placed the RBBP and IRBBP species into three levels of resolution: 10-km, 100-km and none. 'None' means the species would not be mapped at any resolution or appear on any 'Square Summaries'. These categories would be used to govern the production of automated maps online and preliminary maps (e.g. for publicity material) and whether a species is listed in the 'Square Summaries' online at tetrad, 10-km square or not at all. We took the RBBP list as the basis for the list shown below and added in a few additional species requested by IRBBP. For species where there is no specific mapping/listing requirement for Ireland we had used the RBBP rating for consistency, although we were fully aware that many of these species did not occur in Ireland. Final production maps for Atlases were scrutinised by RBBP and IRBBP and these rules may have been relaxed, or tightened, for some records if conditions permitted. We encouraged all records to be submitted to BTO in accordance with this policy but if observers had particular concerns we were happy to discuss these. Note also that all records received for these species were passed on in confidence to the RBBP and IRBBP. We recommended that if an observer was concerned about a record of a rare breeding bird, then details were submitted confidentially on paper to one of the Atlas Organisers (Dawn Balmer at BTO, Bob Swann c/o SOC and Brian Caffrey at BirdWatch Ireland Midlands Office). Free: Listed at Tetrad level (2 x 2 km square) in 'Square Summaries'. 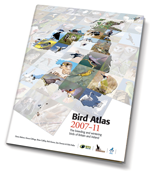 No national maps will be produced at the tetad level for the Bird Atlas.